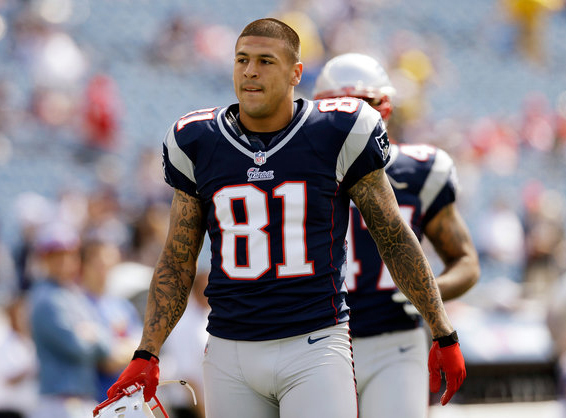 Aaron Hernandez is an American football player who was born on November 6, 1989 in Bristol, Connecticut. Despite his amazing talent, many NFL teams were hesitant about drafting him due to his admission of previously failing a drug test. Aaron ended up going through to the fourth round in the 2010 NFL draft before the New England Patriots picked him as their 113th pick. After receiving All-American honors from the University of Florida, Hernandez was quick to prove himself as a quality tight end for the New England Patriots. Having established himself as the youngest player in the NFL when the 2010 season began, he proved immediately he was able to thrive at a higher level. He set team records as a rookie tight end helping the Patriots secure their route to the AFC Championship. This successful season aided Aaron Hernandez in rising net worth. Everything came to an abrupt halt when Aaron was arrested and then charged with first-degree murder of a semi-pro football player named Odin Lloyd. Police were quick to discover and track evidence that led them right to Hernandez. The Patriots quickly announced his release from their team only two hours after he was arrested. Shortly after this, his sponsors dropped Hernandez as well. Aaron Hernandez’s net worth was about to take a heavy hit. During his lengthy murder trial, other allegations against him became known. A man in Florida accused Hernandez of discharging his weapon and causing him to lose an eye during the attack. When 2012 came around, Hernandez found himself in even more trouble with two more murder charges from a 2012 drive by shooting. The trial for the killing of Odin Lloyd started in January of 2015. It lasted for nearly two months, but on April 15, Hernandez was found guilty of first-degree murder in Lloyd’s case. Because of Massachusetts law, he automatically received a life sentence with no parole possibility. More recently, Hernandez found himself involved in a prison incident where he participated as the role of a lookout for a larger group of inmates who started an altercation. He and two other prisoners were disciplined for this fight, according to a CNN source. His attorney has claimed that Hernandez is slowly running out of money and that Aaron Hernandez’s net worth may not be what it once was. How Much Is Aaron Worth? There have been many claims that Aaron Hernandez’s net worth is estimated to be as high as $8 million. Aaron’s contract with the New England Patriots was worth $41 million dollars and was valid for a seven-year stretch. Out of those $41 million, $16.5 million in a lump sum was guaranteed to him and this sum has added to Aaron Hernandez’s overall net worth. In 2014, he earned $1.3 million, and in 2015, he earned an additional $2.3 million. By 2016, he is set to take in $5 million. By the year 2017, Aaron Hernandez is set to get $6 million. All of this continuing income comes in handy as he still supports his fiancée Shayanna Jenkins and their two-year-old daughter.